OMH Mi A1 Font Helper v1.0 is a small application for windows computer which allows you to to quickly install the Myanmar Font on your Xiaomi Mi A1 Smartphone with its simple and easy to use interface. This tool comes with several features to repair and manage Xiaomi Mi A1 Smartphone. The other features of OMH Mi A1 Font Helper v1.0 includes Bootloader Unlock and Install Patch boot. 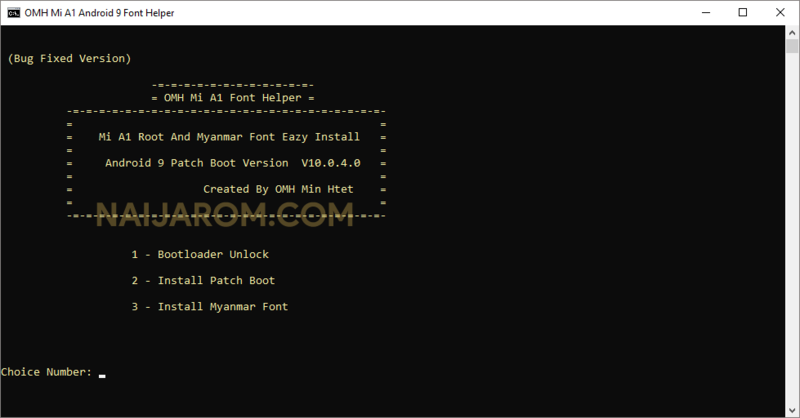 It becomes really easy to install Myanmar Font on your Xiaomi Mi A1 mobile phone using OMH Mi A1 Font Helper v1.0 Tool. It is a free and open source tool which allows you to install the Myanmar Font on your Xiaomi Mi A1 Smartphone in a single click only. In order to use the OMH Mi A1 Font Helper properly, you need to install the Universal ADB Driver on your Computer. Once Driver is installed you can successfully connect your Android Device to the computer, and launch the OMH Meizu User lock Remover on the computer. [*] Credits: OMH Mi A1 Font Helper is created and distributed by OMH Min Htet (developer). So, full credits goes to OMH Min Htet (developer) for sharing the tool for free.